Multiplying light through science and art. To commemorate a special occasion we were asked to create, in collaboration with artist and designer Sarah Wiestner, a one-of-a-kind installation using optical prisms and light. 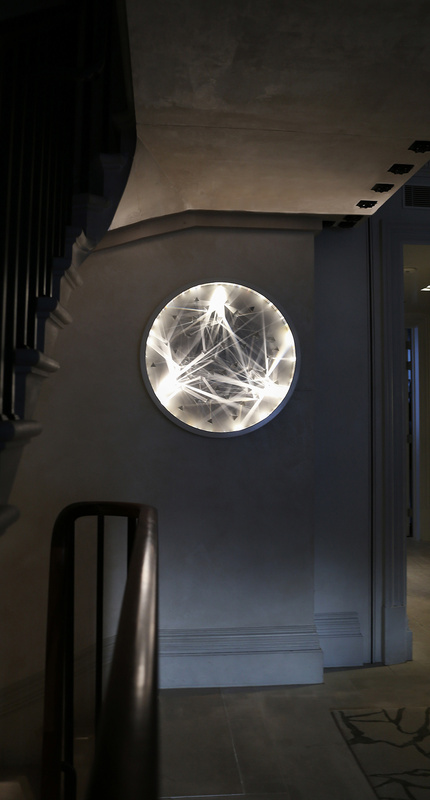 Through refraction and projection the feature piece creates a spectacular light display on the wall of a private residence in Knightsbridge, London. 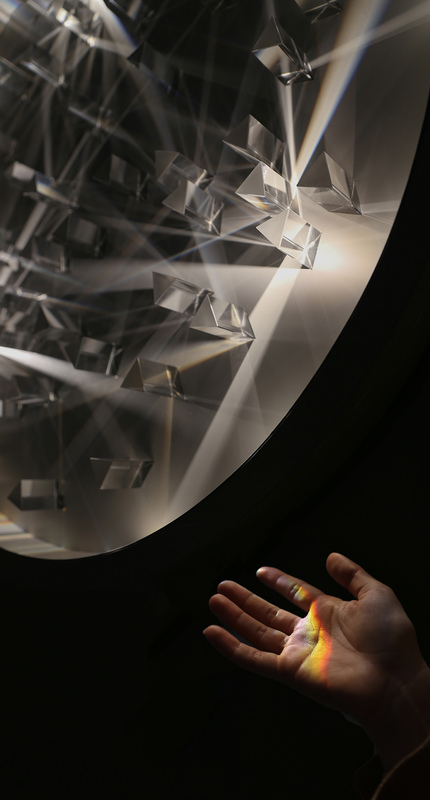 The bespoke light sculpture we designed and produced comprises 50 crystal prisms mounted on a circular background. The overall disc-shaped frame was chosen for its softer geometry, making sure no other element of the sculpture dominates the light show. We purposely used aluminium for its lightweight property and a powder-coated matt white finish to provide the ideal canvas. The location of each prism and three miniature light sources (within the frame) were carefully calculated to create the optimal pattern of light – culminating in the perimeter capturing shards of light and rainbows. To change the reflections and angles of light, for a different effect, we chose a light source with a flexible “eyeball” feature. 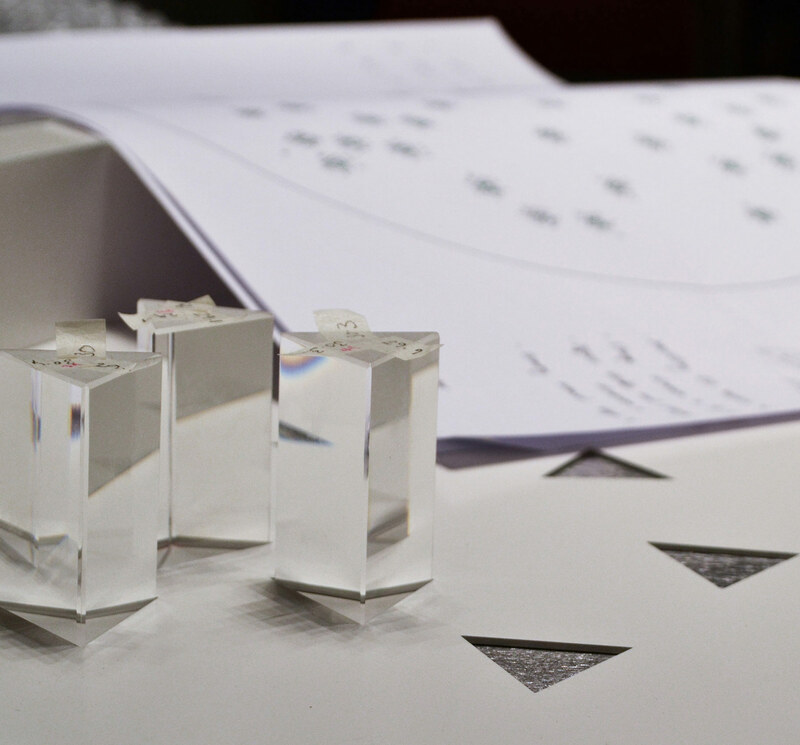 To secure the prisms into place, the base’s top layer had triangular apertures laser cut and the bottom layer was finished with a hidden abrasive surface.